The highly infectious disease, measles, kills thousands of people around the world every year. The World Health Organisation has just announced that the number of measles cases in Europe in 2017 was four times the rate for the previous year. Experts say that this worrying trend is partly due to a fall in immunisation rates - and one reason for this drop is public fear about the safety of vaccinations. Hello everyone! I'm Charlene from BBC Learning English. Today we're talking about measles, a disease which kills thousands of people around the world every year. The World Health Organisation has just announced that the number of measles cases in Europe in 2017 was four times the rate for the previous year. Experts say that this worrying trend is partly due to a fall in immunisation rates - and one reason for this drop is public fear about the safety of vaccinations. Everybody's talking about it, and I'm asking three questions to find out the actual words people are saying. Question one. Are you concerned about the rise in measles in Europe? Yes, definitely. As a mother of a young child anyway, I've always made sure she's had all her vaccinations on time and it gives me peace of mind. Yes, yeah I am concerned about that. If, you know, people aren't being vaccinated, it's important to get vaccinated, definitely. Do you think people are right to worry about the safety of vaccinations? I don't think so. I think the record is that they're proved to be quite safe. I wouldn't say they need to worry, but I think they should take it seriously and act responsibly. Some people want measles vaccinations to be made compulsory by law. Would you go along with that? I would actually, yeah, because it helps the others as well … I would agree with that, I would. At the end of the day I think it should be left up to the individual to decide, but for something as serious as that, then maybe it wouldn't be a bad idea. I think everybody's got their own right to choose … I think if they can promote it positively, then more people will choose to have it done. 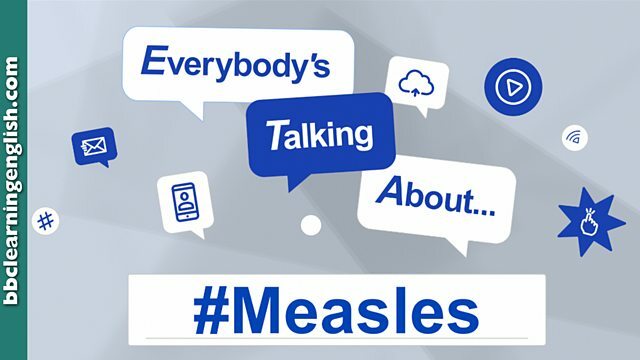 So there you go: Everybody's talking about measles and now you can too! There's a recap coming up in just a second – but before I go, don't forget you can find more about this topic at BBC Learning English dot com. You can also find us on Facebook, Instagram, Twitter and YouTube - and get talking! See you next time! This phrase relates to time. What can you say to indicate that you've considered all sides of an issue? This word means 'very old' and is sometimes used informally to describe something that isn't up to date. Which word does NOT fit in the gap? "I ______ agree with that." We add -ly to the end of many adjectives to form adverbs. Choose the correct spelling of this adverb that you can use to say you are 100% certain. Is the speaker talking about the past or the future? And is this a real, possible, or impossible situation? Yes, yeah, I am concerned about that… it's important to get vaccinated, definitely. I would, actually… I would agree with that, I would. Everybody's got their own right to choose. No I'm not worried about measles at all. Because people are being more conscious about these deases and how dangerous they are. So there's no need to make vaccination compulsory by law. Yes, I am worried about measles because it could be a dangerous disease for adults and especially for children. It's a very contagious disease. So I don't understand that some people prefere to expose their children to this disease even to the death when there is a vaccination considered sure and efficient against it. I trust vaccinations in general. It's true that it is not possible to know a 100% how the body could react against a vaccine but the benefits are worth taking this risk. Everybody must take one's resposability for the benefit of one's family and one's community in order not to contaminate other people. Official figures show that measles cases increased in France between 2008 et 2016. The Governement has decided to make vaccination mandatory from 2018 and not only against measles (eleven in total). I completely agree with this decision. Yes, I do worry about the measles, because it is a world wide epidemic in the same level as the polio and both diseases has no two ways to conquer them but only by vaccination. I think there should be no need to have concerns about the safety of vaccinations so long as it has already been scientific proven for immunisation. I think the majority of the people who mostly never took their children to be immunised are eventually turn up to have no realistic reason to prove whenever they confronted by relevant authority, therefore I would argue that whoever fails to get their child vaccinated should be forced by the rule of law. To sum up my opinion I suggest that the measles vaccination should be made compulsory all over world.